UIStackView is a brilliant abstraction. Sometimes I love it, other times I hate it. UIStackView can make some very difficult layouts a bit easier. But can it have borders? Not easily. It needs to have the right conditions and the borders actually have to be part of the stack view. 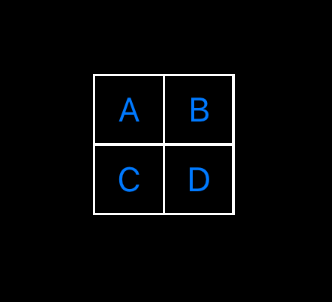 In this example I'll make a simple 2x2 cell grid. To get this to work you'll need to nest 2 stack views inside of 1 outer one. The outer stack view needs to have its axis perpendicular to the inner one. While it doesn't matter which axis is the outer one, in this tutorial I have the outer stack view be a vertical stack view. If you do it the other way you'll have to reverse the constraints. The inner stack views contain the buttons A, B, C, D. I've expanded just the first one of the two inner horizontal stack views so that you can see how the A and B buttons are surrounded by UIViews that have width constraints set to 1. These white views will provide the vertical borders between and around the buttons. Here is the whole view hierarchical outline. Notice I've added horizontal and vertical centering constraints between the outer stack view and the main view. Remember that this gets pretty complicated but is a hack to get something small and simple to work. 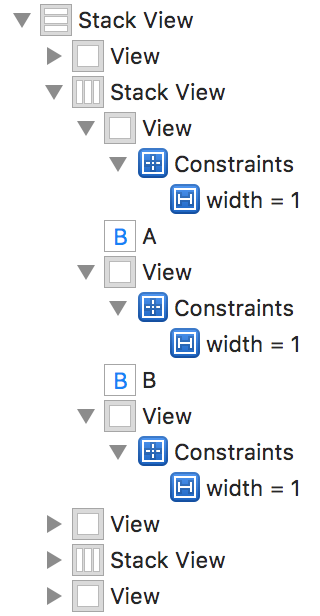 If you have a much larger number of arranged subviews then this might be too much work and if you are changing the layout axis based on size classes you'll have to have 2 sets of all these constraints. 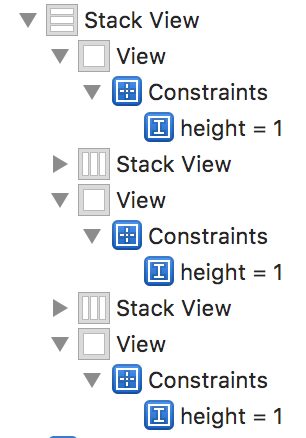 Its also important to note that even if I had 1 dimensional layout, like just simply a single column of rows I still need the nesting of stack views since borders need to be applied in 2 dimensions. Good luck. You can visit my BorderedStackViewTester github repository to download the project and see exactly how the storyboard file looks.